These exterior double doors are perfect garden doors for a home that opens onto a patio or into a garden, such as is the case here. 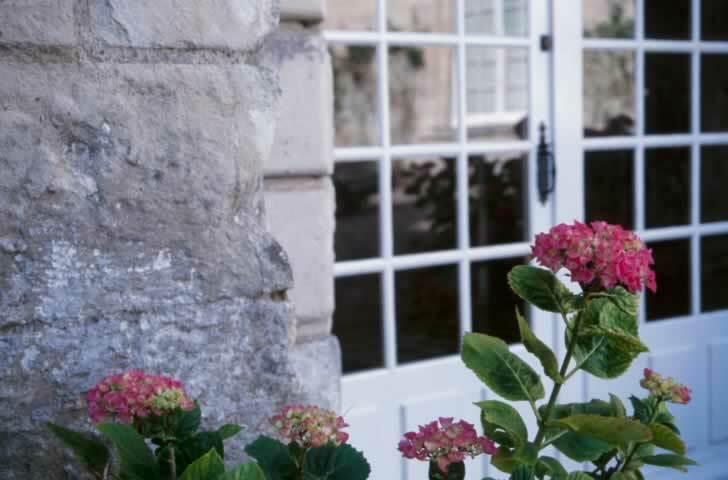 Classic French doors have lites--or panes of glass--joined by mullions extending the whole length of the door within a frame. This particular set of double doors has three identical raised panels along the bottom rail of each door. Because of this, these doors are not considered true French doors; however, this type of door may be preferable to high traffic areas as feet and wayward furniture will do damage to the panels that can be cleaned or repaired, unlike glass panes which would require replacement. Only one door has a door handle with a lock, so the other door is most likely held in place with an interior sill or lentil bolt.